A wintry-fresh favorite, these mouthwatering mints feature a cool, creamy mint chocolate center coated in milk chocolate or green confection. Breathtakingly delicious. Kosher OU-D.
Ready for a delicious twist on an after-dinner or anytime mint? 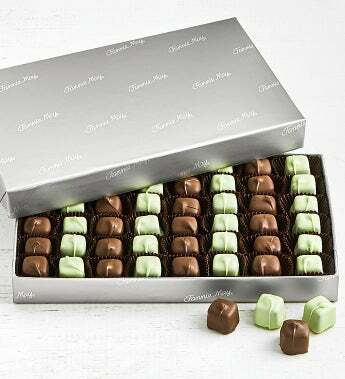 Indulge in legendary Fannie May Mint Meltaways®. They're perfect for those who crave the cool combination of a mint chocolate center and a milk chocolate or creamy pastel shell. Kosher OU-D.